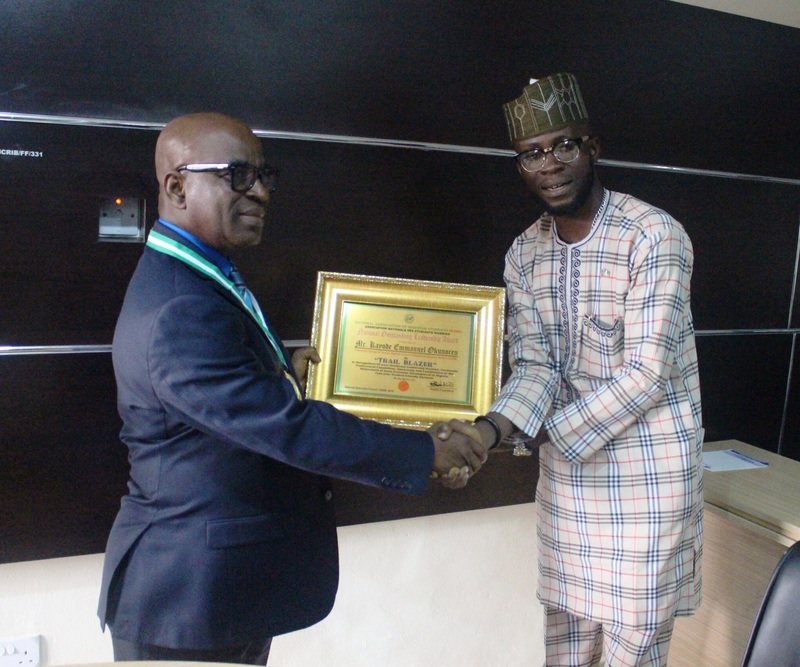 The President, Nigerian Council of Registered Insurance Brokers (NCRIB), Kayode Okunoren receiving National Outstanding Leadership Award 2016 from the Vice President, National Association of Nigerian Student (NANS), Comrade Lawal A’Pounds at the NCRIB Secretariat recently. 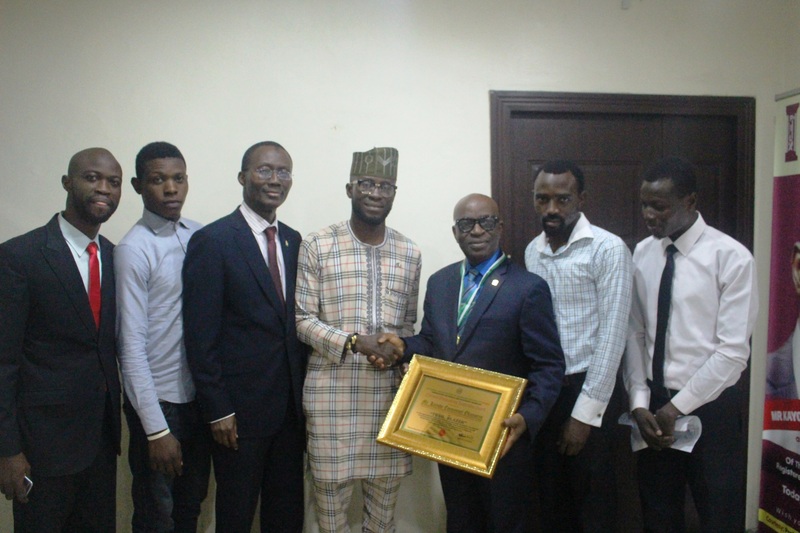 National Association of Nigerian Student (NANS) has conferred on the President, Nigerian Council of Registered Insurance Brokers (NCRIB), Kayode Okunoren, National Outstanding Leadership Award 2016. The award which was presented to him at the NCRIB Secretariat in Lagos by the NANS President ably represented by NANS Vice President, Comrade Lawal Alpounds was in recognition of Okunoren’s contribution to Nigerian economy through his participation in Insurance Industry. According to the NANS representatives, two Nigerians were nominated for the award from which Okunoren emerged the winner after a former ratification on the floor of NANS Senate held in Abuja. In his speech, Comrade Alpounds lamented the dangerous trend of selecting politicians who have contributed nothing to the development of the Nation they were called to serve for awards, stressing that it further erodes the values and importance of awards. He added that Nigerians Students under the aegis of NANS has distanced itself from doling out awards to people of questionable characters who could not add any meaningful value to the nation but rather look for means to exploit others. One of the reasons for Okunoren’s emergence as the recipient of the award according to him was his recognition for the place of mentoring as part of values that could build a nation. Okunoren eulogised and appreciated the doggedness of Nigerian Students in spite of the state of the nation’s educational system, using the opportunity to inform them of his mentoring programme that spanned beyond insurance but to all Nigerian Youths. The President, Nigerian Council of Registered Insurance Brokers (NCRIB), Mr. Kayode Okunoren in handshake with Vice President, National Association of Nigerian Student (NANS), Comrade Lawal A’Pounds after the presentation of National Outstanding Leadership Award 2016 to Mr Okunoren at NCRIB Secretariat, with them are the Executive Secretary/CEO, NCRIB, Mr Fatai Adegbenro and other NANS’ Exco. “I share your vision, I believe in you, especially, the endowment fund that is meant for indigent students among you. That has been my passion, and I am committed into it. It is my joy to mentor Nigerian Youths out of poverty. Your presence here today and this award will help me to double my efforts not to disappoint the students,” Okunoren noted. Also speaking at the event, the Executive Secretary, Nigerian Council of Registered Insurance Brokers (NCRIB), Fatai Adegbenro stressed the need for the nation to pay more attention to the development of education adding that the best way to tackle terrorism is to educate the youths. He assured the leaderships of NANS of the Council’s support to the endowment fund. The award came in two categories, one directly to the President and the other to the Staff and Management of the Council.